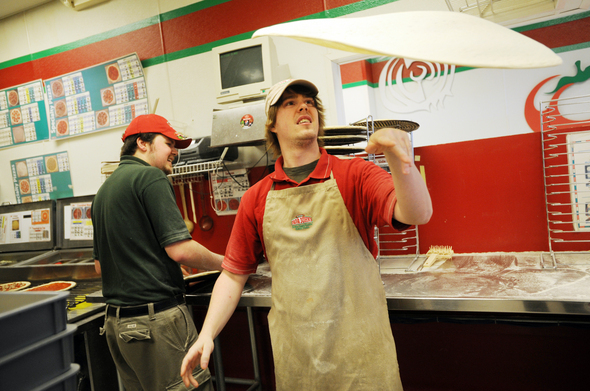 Posted on Sun, Feb 5, 2012 : 5:58 a.m.
Papa John's employee Eugene Braig spins pizza dough in the air as his co-worker Matt Majewski works on a pie behind him. Extra pizza boxes are ordered, staff is increased and online ordering systems are up and running as pizza companies in the Ann Arbor area prepare for the New York Giants to play the New England Patriots Sunday. 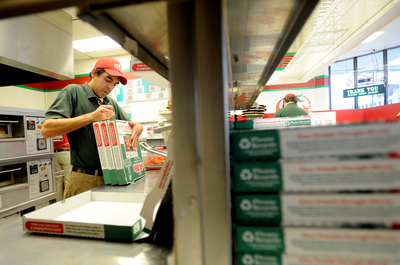 Owners agree: Super Bowl Sunday marks the biggest sales day of the year for pizza delivery stores. The National Restaurant Association predicts 48 million Americans will order takeout or delivery food while watching the game, with 60 percent of those customers ordering pizza. Ann Arbor Township-based Domino’s Pizza is expecting to sell 11 million slices of pizza this Super Bowl Sunday, a nearly 80 percent increase from a typical Sunday. It’s also two million slices more than Domino’s predicted selling during last year’s Super Bowl. The reason for the increase, said Domino’s spokesperson Chris Brandon, is largely due to the company’s online ordering system. At Super Bowl time last year, Brandon said Domino’s online ordering accounted for 20 to 25 percent of its sales. This year it has increased to 30 percent. To help ensure the process runs smoothly, Domino’s has a technology team of more than 50 people stationed in a conference room at its headquarters to monitor the website. In 2007, that team was only seven people. Many Domino’s locations have also increased weekend staff, Brandon said. Andrew Jager, assistant manager of the Papa John's on East Huron in Ann Arbor, said the store has already stacked up extra boxes to prepare for the Super Bowl rush. For Lisa Morden, general manager at Aubree’s Pizzeria in Dexter, the football rush is less predictable. The franchise location - which opened in summer 2011 - has never experienced a Super Bowl Sunday. Although she doesn’t expect the restaurant to be swamped, she does hope the delivery business picks up. At Ann Arbor’s Papa John’s location on East Huron Street, extra pizza boxes are already stacked in the back to prep for the event. Jager said sales “easily” double and sometimes triple on Super Bowl Sunday, and he expects no less this year with Papa John’s being the official pizza sponsor of the NFL. He said he definitely sees an uptick in business because of “nonstop” commercials and other advertisements. The Kentucky-based company is also hosting the Super Bowl XLVI Coin Toss Experience, a promotion that will give rewards members a free large one-topping pizza and 2-liter of Pepsi MAX if the majority of voters correctly predict a coin toss online before the game. He said the Ann Arbor Papa John’s location does mostly delivery sales on Super Bowl Sunday, and the store has increased its Sunday staff. Sun, Feb 5, 2012 : 10:35 p.m. I ordered my pizza last night. But if i was going to order again tonight it would be from City pizza or Ann Arbor Pizza, my 2 current faves. And no I'm not connected in any way with either other than as a happy customer. Sun, Feb 5, 2012 : 10:57 p.m.
Sun, Feb 5, 2012 : 6:11 p.m.
And don't forget to tip your delivery person! !